While circling around UCLA looking for a good place for breakfast, we chanced upon a cafe called Le Pain Quotidien. One of their signature menu item is Avocado Toast. When it was served, I knew instantly that I want to replicate it at home. It’s really a very simple, tasty, healthy breakfast that takes no time to prepare. Try it, you’ll be addicted to the avocado ‘butter’. Coarsely mash the avocado with potato masher. Sprinkle sea salt, ground cumin, lime zest, and lime juice over the mashed avocado. Mix well. 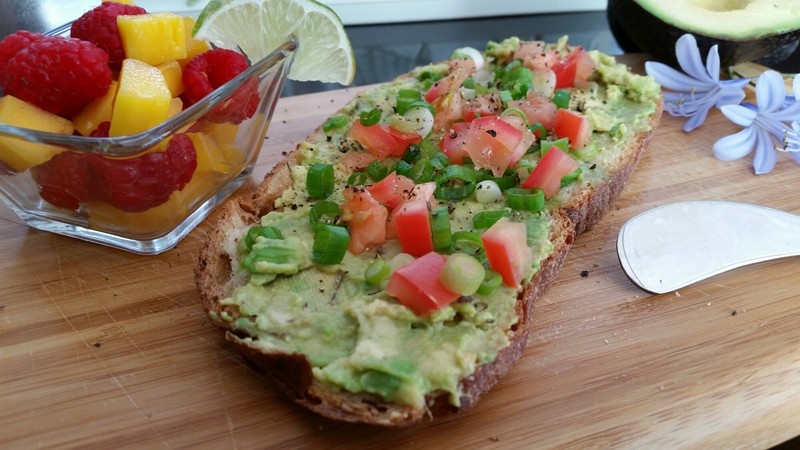 Spread avocado butter generously over the toasted bread. Sprinkle diced tomatoes and chopped green onions on toasts. Add a dash of ground black pepper. Serve with fruit cup or freshly tossed salad.